Cellulite is caused by structural changes in the subcutaneous fat layer, and cannot be dispersed without massaging the internal layers. Cellulite can cause many of us to struggle with self-confidence, influencing how we see ourselves and how we dress. If you can identify with that, you’ve probably already tried many ways to get rid of cellulite, but found no effective solution. Regular use of Pranamat ECO creates a visible difference after just 30 days; your skin will become smoother and more elastic. Leaves your skin supple and elastic. Clinical studies conducted in Europe in 2014 have proven that the use of Pranamat ECO significantly increases blood and lymphatic circulation. 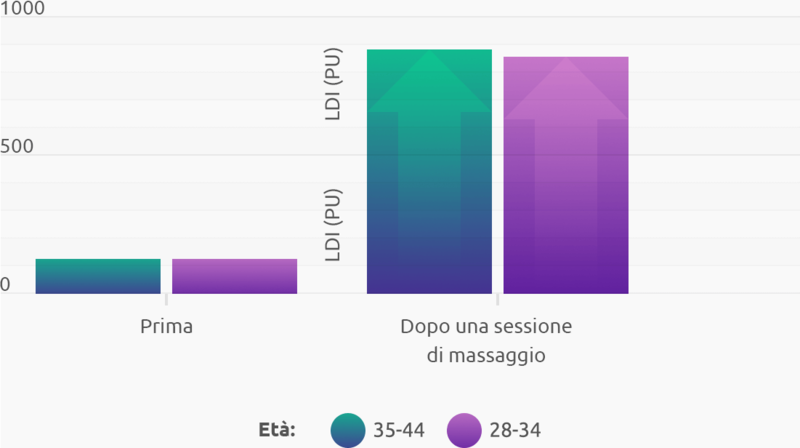 In the graph you can see the increase in microcirculation in two groups of women – based on their age range – after their first 20-minute session using Pranamat ECO. By exerting evenly-distributed acupressure on more than 5000 points on the skin, Pranamat ECO increases blood and lymphatic flow and nourishes the skin cells with oxygen. This increase in circulation brings heat to the area, stimulating the elimination of toxins and fluids accumulated in the problem-area. Regular use of Pranamat ECO minimizes the appearance of uneven skin, improves skin-tone and leaves the skin supple and elastic. Pranamat ECO is an effective, natural method to eliminate cellulite. It is simple to use and can be done from the comfort of your own home. In just 15 minutes per day, it can return smoothness and elasticity your skin. By improving blood and lymphatic circulation, regular anti-cellulite massage helps treat cellulite without the need to diet or exercise. Cellulite is not just a cosmetic issue. It is produced by structural changes in the subcutaneous fat layer, which cannot be rectified without massaging the innermost layers. Fat cells are encapsulated in vertical cells formed by collagen fibers. When these cells fill with clumps of toxin-filled fat, the connective tissue stretches, preventing normal blood and lymphatic circulation. Eliminate cellulite in 15 minutes per day! Use this simple program daily, and within one week you will start to see the difference. Your skin will be smoother and more elastic. If you do not have time to do the whole program, simply sit on the Pranamat ECO mat or the Pranamat ECO pillow whilst watching a movie or reading a book. Models the shape of the thighs and buttocks. Smooths the outer surface of thighs. Do you worry about your body? Do you sometimes feel unable to wear the clothes you want to wear? Would you like to feel more confident in a bikini or swimsuit? It's time to feel beautiful again with Pranamat ECO! The pointed lotus-petal-shaped elements work gently on the deepest layers of skin improving blood and lymphatic circulation. Blood flow to the problem areas is immediate. You will feel better from the first day you use it! This acupressure set does not scar the skin or damage blood vessels, it works effectively and safely. Pranamat ECO is simple and easy to use.